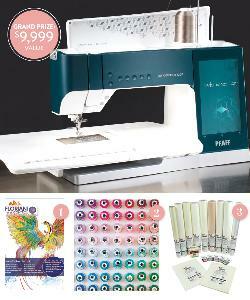 Prize: Grand Prize: PFAFF Performance Icon Sewing Machine ($9,999). 1st prize: FTC-U—RNK’s Premier Embroidery Software ($4,299). 2nd prize: 120-Spool Thread Set ($718). 3rd prize: Mega-Sized Stabilizer Kit ($500). What you must do to enter: complete form -- click the "no" option -- it will take you to a subscribe page --- just click out of that page (you DON'T have to subscribe to enter/win).